We’d love your help. Let us know what’s wrong with this preview of Botanicum by Kathy Willis. To ask other readers questions about Botanicum, please sign up. I received a copy of this title from Five Mile Press for review. An introduction to the world of plant-life presented in a visually stunning format. Given that I don’t know much about plants, I thought I would instead explain to you the things you really need to know about Botanicum; those things that will inspire you to make this eye-catching book part of your collection. You know how in some middle grade, usually fantasy stories there might be a scen I received a copy of this title from Five Mile Press for review. You know how in some middle grade, usually fantasy stories there might be a scene where some kids stumble across a dusty old book in a forgotten or forbidden library? They pull it from the shelf and it’s heavy and the paper is thick and it’s filled with arcane knowledge that will provide the key to whatever mysterious problem they have to solve? This is that book. (Except for the old, dusty part). 2. It champions white space. Unusually for a non-fiction tome, Botanicum makes brilliant use of white space to ensure that the reader doesn’t feel like they need a magnifying monocle to read the text. Each page spread is devoted to a small amount of pertinent information about the plant type in question, accompanied by a page of beautifully illustrated examples of the plant type. The fact that the book is so big means that the pages lie satisfyingly flat, allowing you to pore over the pages to your heart’s content. The book covers a wide range of plants, from mosses, fungi and ferns to the giant sequoia, succulents, carnivorous plants, vines and fruit trees. Truly, if you want to know some basic background about things that grow, or how to tell your hornwort from your hellebore, Botanicum would be a great place to start. 3. It’s eye-poppingly gorgeous to look at. It’s pretty obvious, from the endpapers to the chapter headings, that the makers of this book know a thing or two about visual design. Everything about this book is visually appealing – the fonts, the colours, the layout – hell, even a cross-section of a breadfruit made Mad Martha want to pull out her crochet hooks and start recreating it in yarn. The book has the kind of illustrations that you want to tear out (carefully), frame and put on your wall. Let’s be honest: even if you know nothing about plants and have no interest in learning about plants, if you pop this one on your coffee table, guests you wish to impress are going to be fooled into thinking you’re a botanical genius. Or at least a botanical enthusiast. З двох причин. По-перше, це неймовірно красиво. Ок, припустимо, я – фанатка ботанічної ілюстрації, тобто є людиною упередженою. Але… це ж правда захмарно прекрасно! По-друге, ця книжка викликає бентежно заздрісний розпач. Чому, чому в моєму середньошкільному дитинстві не було такої прекрасної книжки, а була “Біологія для шостого класу” Морозюк? Причому в моєму шостому класі був ще якийсь спрощений радянський підручник, а отой біленький монстр з маком на обкладинці наздогнав уже у восьмому, коли проганяли програму для “районки” з біології. Believe me, прочитати перше видання підручника Морозюк (з усіма респектами до “першого вітчизняного шкільного підручника з ботаніки”) з його переускладеною лексикою та манерою викладу, ніби то для дуже замотивованих студентів, а не для школярів, за два дні – це нефігова психологічна травма. Ні, в “Ботанікумі” теж розповідають про вайї з архегоніями, але роблять це повільно, охайно та старанно повторюючи “людськими словами”. Професорка Кесі Вілліс – завідувачка науково-дослідницького управління в К’ю – свою частину справи зробила круто. Статті тут поділяються на дві частини: перша – дуже загальний вступ до теми, друга – уточнення специфіки, що йдуть “додатком” до ілюстрації. І от складні технічні моменти та більшість специфічних термінів ідуть якраз в тих “додатках”, а їх можна читати, а можна і нє. Можна й взагалі не читати, а картинки роздивлятися, вони ще крутіші. Ото в блозі якраз показую. Muazzam bir bilgi müzesi. Üstelik bu müze her zaman ziyaret edilebilir durumda. Hem bitkilerin tarihini, hem türlerini hem de ne kadar önemli olduklarını öğreniyorsunuz. Sıkılmadan herkesin okuyabileceği mükemmel bir çalışma. Özellikle çocuklarınıza bu tip çalışmaları almalısınız. Wow! Beautiful book. The artwork is amazing and there is so much to learn. excellent addition to a homeschool library or budding artist's collection. the illustrations are detailed and easy to study; the tree of life is my favorite to get lost in. also, the large format is perfect to illustrate the plant world. I love this book and don't want to return it to the library. I stumbled on it on the junior books section and was attracted by the beautiful color drawings. Each page could be framed. And because it is written for younger readers, the science of plants is explained simply and powerfully. This is a gorgeous book! It is a book jam-packed with such a plethora of information about plants from the tiniest to the largest, from above ground to those tucked away underneath rocks or soil. It is a treasure trove of botanical information for the young and young at heart. The book is touted for those ages 8 to 12 but surely they can't mean that! This book is a treasure and plant lovers (and soon-to-be plant lovers) of ALL ages will find themselves immersed for hours observing the detail of t This is a gorgeous book! It is a book jam-packed with such a plethora of information about plants from the tiniest to the largest, from above ground to those tucked away underneath rocks or soil. It is a treasure trove of botanical information for the young and young at heart. The book is touted for those ages 8 to 12 but surely they can't mean that! 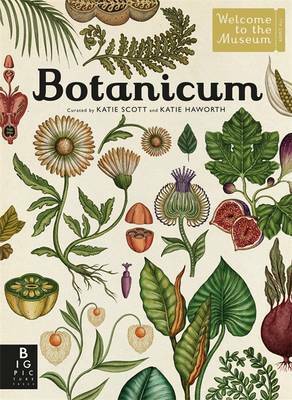 This book is a treasure and plant lovers (and soon-to-be plant lovers) of ALL ages will find themselves immersed for hours observing the detail of these beautiful illustrations by Katie Scott and reading the explanations by Kathy Willis that is all about each particular plant. Couched in the guise of a "night at the museum" or a "let's visit the museum" you are introduced to the plants as though you were on a tour of a lovely plant museum. The pages are laid out with just the right amount of information (don't forget, they said this is for those "tweens" you know, but hint-hint very busy adults will find that the amount of information is just right for them as well). The lay out is not so crowded that the reader is overwhelmed and is just right so that the fine details can be readily absorbed. What Audubon did with his fabulous illustrations of the birds of the world, this book does for plants. This is a marvelous coffee table book and one that you will be proud to display. Great for home and all libraries - schools and public. This book is gorgeous and so informative! For adults and children alike, this an absolutely wonderful book. Informative without being condescending and easily understandable, this is an opportunity for all of us to learn something new about the plant life that makes up so much of our world. Often plants might be dismissed as simple structures, when the reality is that they are extremely complex - sometimes perhaps almost as much as humans! I particularly enjoyed the illustration for the cacti, succulents and carnivorous plants which I k For adults and children alike, this an absolutely wonderful book. Informative without being condescending and easily understandable, this is an opportunity for all of us to learn something new about the plant life that makes up so much of our world. Often plants might be dismissed as simple structures, when the reality is that they are extremely complex - sometimes perhaps almost as much as humans! Gorgeous and fascinating!! I want wall paper made of the images...does it exist? I have a real fondness for illustrated reference texts - in part because it makes me think of the kinds of glossy illustrated encyclopaedias you would use as a child, and partly because it just makes me want to draw random collections of interesting things. Botanicum is, above all things, an absolutely beautiful book. Every page is a delight and you’re left wanting to go back to the start to pore over them again. The level of text is just right - enough to provide context and spark interest, but I have a real fondness for illustrated reference texts - in part because it makes me think of the kinds of glossy illustrated encyclopaedias you would use as a child, and partly because it just makes me want to draw random collections of interesting things. Botanicum is, above all things, an absolutely beautiful book. Every page is a delight and you’re left wanting to go back to the start to pore over them again. The level of text is just right - enough to provide context and spark interest, but by no means overpowering the illustrations. I found this fabulous book in the Elliot Bay Bookstore in Seattle--in the children's section, although it is a book for all ages. I was attracted to the exquisite botanical illustrations--it is worth perusing for that alone! It is a great overview of the plant kingdom, and it includes plants from all around the world. Although condensed, it is still a wealth of information about the different types of plants and what makes them unique. Absolutely beautiful book!!! These books a effing gorgeous and extremely informative! Presented in a very well-thought out manner, I found it easy to digest as a newbie while also giving me a really good grounding in what the heck plants are all about. But really, I'm in it on these series for just how freaking beautiful these books are. Welcome to the Museum is a MUST BUY for my library. Pulled this beautiful book off the cart at the library before they could find a shelf big enough for it to fit on. Gorgeously illustrated, yes. But also well written. (That has not been my general experience with large coffee table eye-candy). The text gives enough information to spark interest and doesn't get bogged down with technical language. I happily devoured every paragraph and picture. I adored this book. I'm really into flora and this book shows in an easy way how everything works. The book is also ceparately in chapters and they're very good separated. I'm really hoping Kathy Scott will publish other books with her botanical drawings because I adore them. I think I would not have bought this book if it wasn't for her amazing drawings. A wonderful children's botany book, with gorgeous illustrations. Uuuunderbara bilder och lite småintressant text men lite väl svårläst för att utge sig för att vara en barnbok tycker jag! Köp/låna den för bildernas skull! Stupendo viaggio in un museo immaginario dove ammirare le meraviglie che il mondo vegetale ci riserva!!! Consigliatissimo per gli amanti della natura e per piccoli botanici!!! This fantastic primer on the world of plants is one of the most beautifully illustrated books I have ever seen.